Raptors get more fearsome all the time. Jurassic Park painted velociraptors as clever, fleet-footed predators, and they may have hunted from trees. Now researchers suspect their turkey-sized relative had a venomous bite — and other raptors might have it, too. 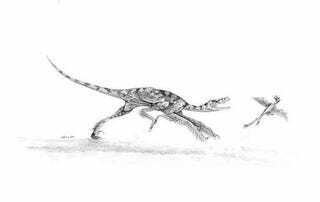 Researchers at the University of Kansas Natural History Museum have been studying the Sinornithosaurus, the "Chinese bird lizard," a diminutive relative of the raptor. Closer investigations of the skull reveal that the Sinornithosaurus had snake-like fangs and pockets in the skull that indicate the former presence of glands. Because of the shape of the teeth and the fact that these gland pockets are connected to the teeth through narrow ducts, paleontologists believe that the glands contained venom. The researchers believe that the bird-like dinosaur had a venomous bite, which it used to subdue its prey. It's a significant discovery for a couple of reasons. For one thing, it offers more clues as to the origin of venom in snakes and lizards, which likely stems from a common ancestors these animals shared with Sinornithosaurus. It also opens up the possibility that other raptors also had venomous bites. The researchers plan to look more closely at other raptor skulls, especially its close relative, the glider Microraptor, to see if they possess similar features.